We went backpacking this weekend. If you are in the Denver metro area, you probably know that there has been really severe weather up and down the front range. We didn't go far enough to escape the weather, but we managed to have fun anyway. We went to the same place we've always been backpacking as a family. Yes, you might think it would get old to keep going to the same place over and over, but the kids really like this area and the fact that we know it so well is useful when it comes to planning and adjusting to things like weather. The first night, we drove to a campsite alone a forest service road on the way to the trail head. We pitched our tent and gathered firewood, started our fire, and had some brats for dinner. Saturday, we needed something to do. I decided to take the family on a hike in Pike National Forest. 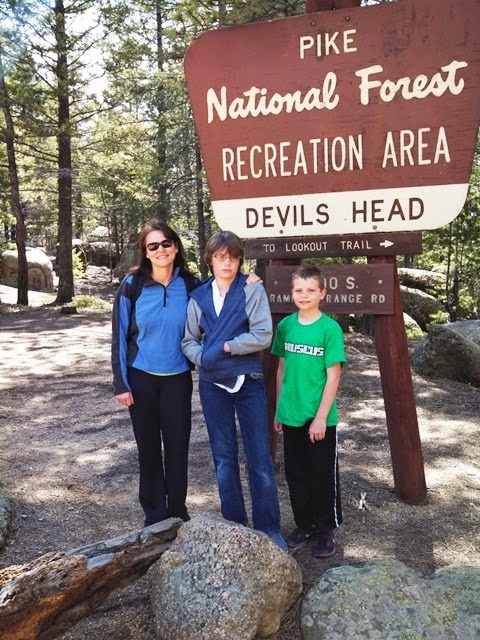 Before the kids were born, my wife and I had done the Devil's Head Fire Lookout Trail, but the kids had never been there and I thought it was something they might enjoy. The drive to the trailhead took longer than I remember. This might be part of the reason we've never brought the boys. But, after about an hour and a half, we were in the National Forest Recreation Area. If you read this blog at all, you probably have at least an inkling that I am a Chicago Blackhawks fan. If you read this blog at all, you probably suspect that I like to brew beer. Ok ... actually, if you read this blog at all, you know I am obsessed with both. Blackhawk Black Ale combines two of my obsessions, as it is a homebrew named after my favorite hockey team. I first brewed Blackhawk Black Ale in late 2009 as an attempt to clone New Belgium Brewery's 1554 Enlightened Black Ale. Back then, it was a partial mash. Obviously, I have since converted it into an all-grain recipe. My wife had a thing to go to Saturday. This meant that the boys had to make a decision. Should we stay inside all day and play video games? Should we spend the day outside riding our bikes? The boys voted for video games. I voted for the bike ride. 2 to 1. I won. One of the few advantages of being the parent is that my vote (usually) counts for more. We loaded our bikes on the back of the minivan and headed over to Chatfield Reservoir State Park. A few days ago I had loaded some geo-caches into my GPS for us to search for at some point. Saturday was a perfect opportunity. Time to brew the Laser Salt Sandy Blonde Ale. And I did. I brewed it last Sunday. Brew day, of course, started before sun-up. The Gnome and I got the strike temperature perfect with no trouble at all. The mash temperature did drop into the mid 140's before the end, which is not really that big of a deal. I'm fine with that.